Economics of Transportation publishes scholarly papers that make important contributions to transportation economics. 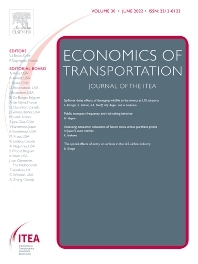 The journal also publishes papers that research the interaction between transportation and other economic activities; papers that seek to promote cross fertilization with other fields of economics including labor, trade, urban economics, and industrial organization; and substantive papers on timely policy issues relating to transportation. The journal welcomes both theoretical and applied papers. Papers are welcome regardless of the originating discipline provided they contribute to the goals of the journal. Economics of Transportation aims to uphold the highest standards of scientific originality and quality.